Uncertainty is part and parcel of weather forecasting, requiring meteorologists to make risk-based decisions based on limited, and at times conflicting, information. Meteorologists rarely know with absolute certainty what is going to happen; instead, they understand future weather in terms of probabilities of different outcomes. Communicating public safety messages based on severe weather event probabilities can be quite challenging, and forecasters have to strike a balance between the need to alert people to the potential for severe weather, and the risk of “crying wolf” by over-emphasising severe weather that might not happen. This is one of the reasons why, at MetService, only meteorologists with a very high level of training and experience work with severe weather. 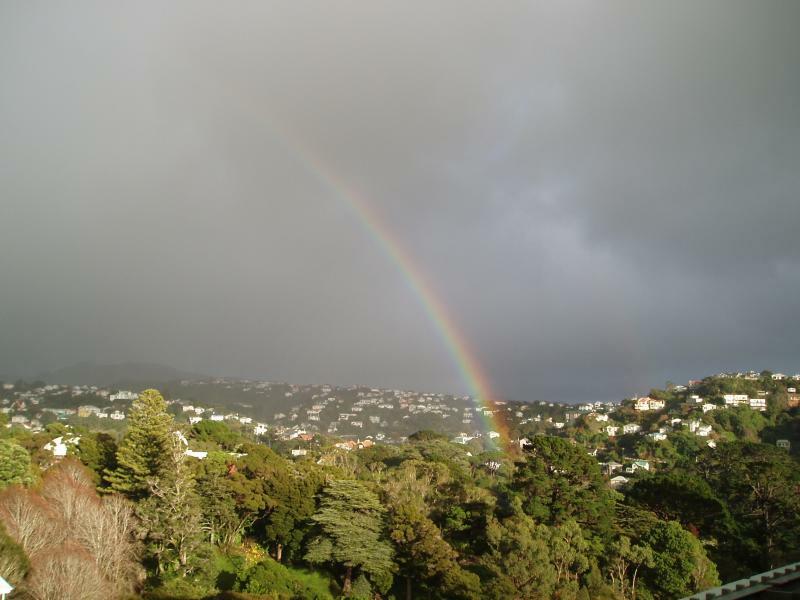 Rainbow over Wellington with Nimbostratus cloud in the background. 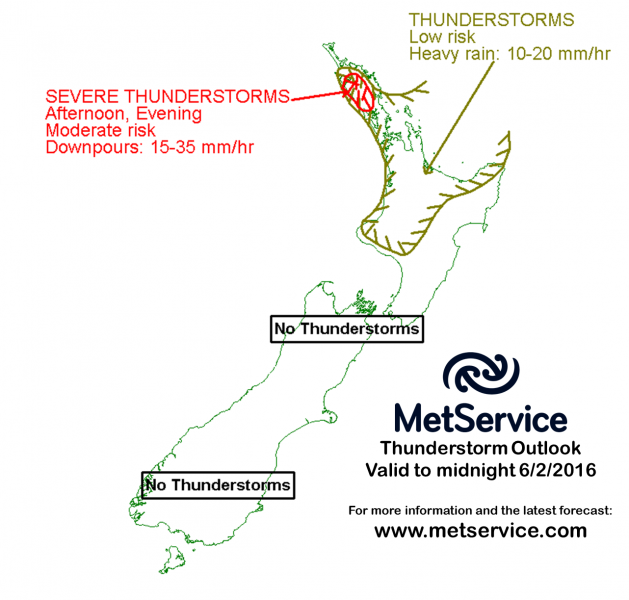 MetService issues a variety of messages advising of potential or existing severe weather. For any particular event, the type of message depends on the time and geographic scale of the event and its predictability. 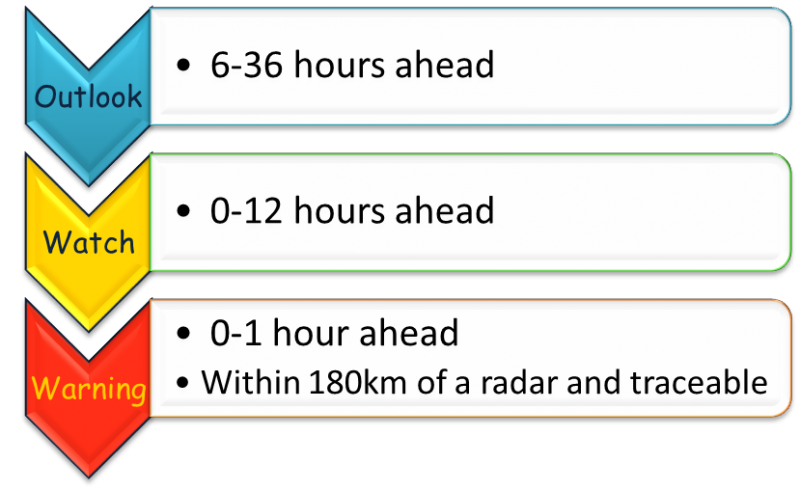 Different approaches are required for broad-scale severe weather events which affect large areas (thousands of square kilometres) and last up to several days, versus local-scale events which typically affect a few square kilometres and last from a few minutes to several hours. First Radar Image: A broad-scale weather event (e.g. in this instance a low sitting to the east of Banks Peninsula), bringing heavy rain to Canterbury. This event lasted at least a day and affected a broad area. Second Radar Image: 14th December 2009 severe thunderstorms over the Canterbury area, one of these caused a tornado in Methven. This event lasted a few hours altogether, and much less than that in any one location. In locations more than about two kilometres from the thunderstorm, severe weather didn't occur. Broad-scale events are caused by weather systems that can usually be identified some days in advance (e.g. lows and fronts), in contrast to local-scale events – usually thunderstorms – that may only be identified an hour or two ahead of time. Predictability of local-scale events is comparatively low and, in many cases, meteorologists can only predict where and when conditions will be favourable for the development of local-scale severe weather, but only issue warnings when severe thunderstorms have been detected. 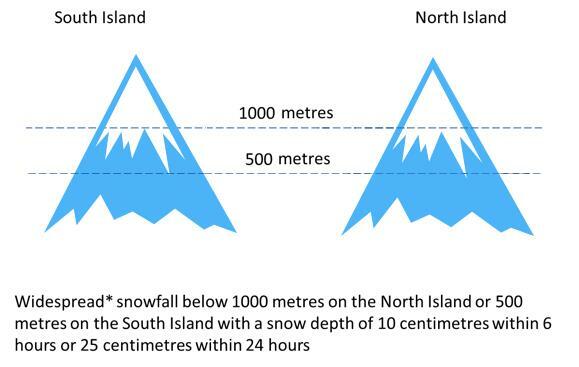 MetService uses a combination of the 1,2,3 to inform people about severe weather. Don’t wait for the warning to work out your plan! MetService’s Severe Weather team keeps a critical eye on the upcoming conditions. Days before potentially severe events begin, the forecasting team will flag these events that look potentially severe in the Severe Weather Outlook, which acts as a heads-up to potentially severe weather occurring in the next five days, so people can start planning. The Outlook briefly explains what type of weather might occur, what is driving it and shows areas which might be affected on a map. Each area of potentially severe weather has a confidence level, based on the Severe Weather Team’s assessment of its likelihood. Above is the Severe Weather Outlook chart issued on April 21rd 2016. Outlooks are important for decision-making more than several days out and are heavily used by hydrologists, emergency managers and many others. 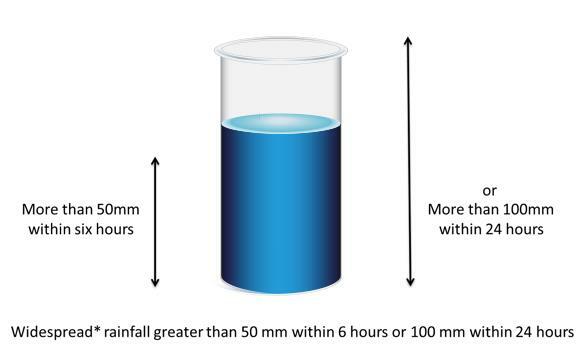 For events where the forecast amounts are expected to not quite reach warning criteria, but will still be significant. 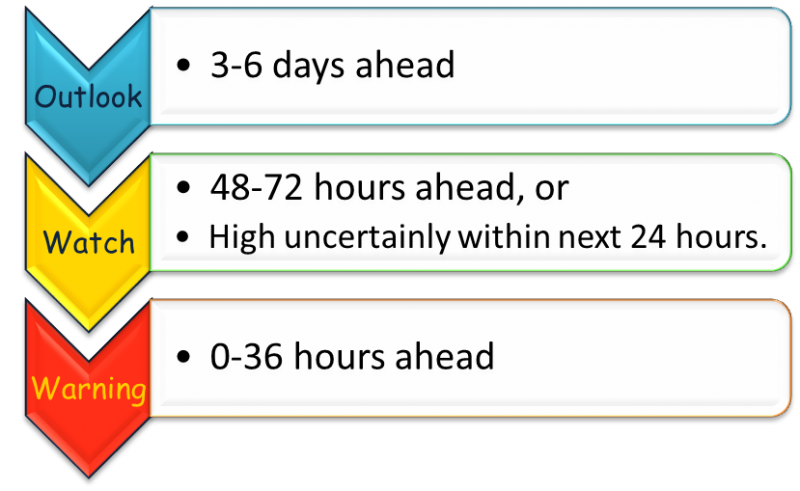 • Within the next 24 hours, if there is a high level of uncertainty. The message is be prepared, particularly for events of low probability but high potential impact, and for events which may be of some significance but do not meet the criteria for issuing a Warning. Watches are an important prompt to take preventative action as part of being prepared; the nature of some events means a Warning might only be able to give a few hours lead-time for action, so the ‘heads-up’ given by a Watch could make all the difference in some cases. Getting closer to the event, the Severe Weather Watch will be ungraded to a Severe Weather Warning if conditions are expected to reach or exceed Warning thresholds within the next 24 hours. Severe Weather Warnings are only issued when potential severe weather events have drawn near enough in time for there to be a sufficient level of confidence - typically 12-24 hours in advance of the event commencing. In some cases where predictability is high, forecasters may have sufficient confidence to support warnings with even longer lead times. When there is a Severe Weather Warning in force the message is to Act; take actions to protect your property, livestock or family etc. If there is a Severe Weather Warning in force it can be found here: http://bit.ly/SWWarnings and on Twitter here @metservicewarn. 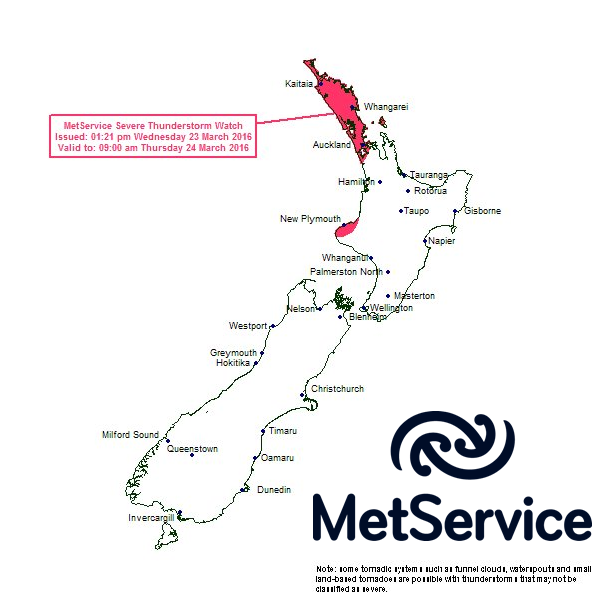 As well as being available on www.metservice.com, MetService Severe Weather Watches and Warnings are available by email. Above is an example of Severe Weather Watches (orange) and Warnings (red) shown on a map and displayed on MetService’s Facebook page. Social media is an important channel that MetService uses to communicate with the public the likelihood of severe weather occurring. Note: The MetService Facebook page is used for education about weather as well as to provide some forecasts, and should not be relied on as your sole source of weather information. 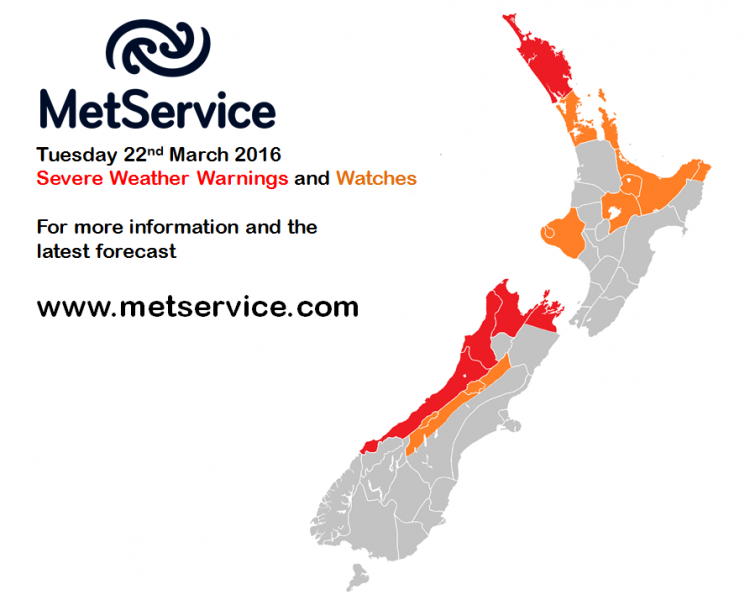 All the latest forecasts, Watches and Warnings are available on metservice.com. What are the WARNING CRITERIA? 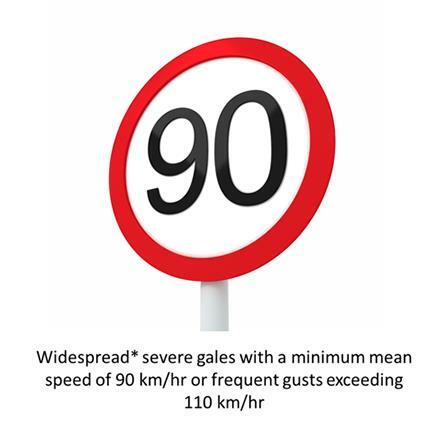 The term “widespread” in all of the above criteria means over an area of at least 1,000km2. Not all severe weather affects large areas. Thunderstorms, for example, generally affect small areas over shorter time scales. The forecasting of thunderstorms is a discipline all of its own and MetService has a group of very experienced meteorologists whose focus is severe weather. Twice every day, one of the things they do is issue the Severe Thunderstorm Outlook. The MetService Severe Weather Team also issues Severe Thunderstorm Watches or Severe Thunderstorm Warnings when the warning criteria is expected to be met. Above is an example of a Thunderstorm Outlook from February 2016; the outlook can be issued 6 to 36 hours ahead of an event, depending on the certainty of the forecast. 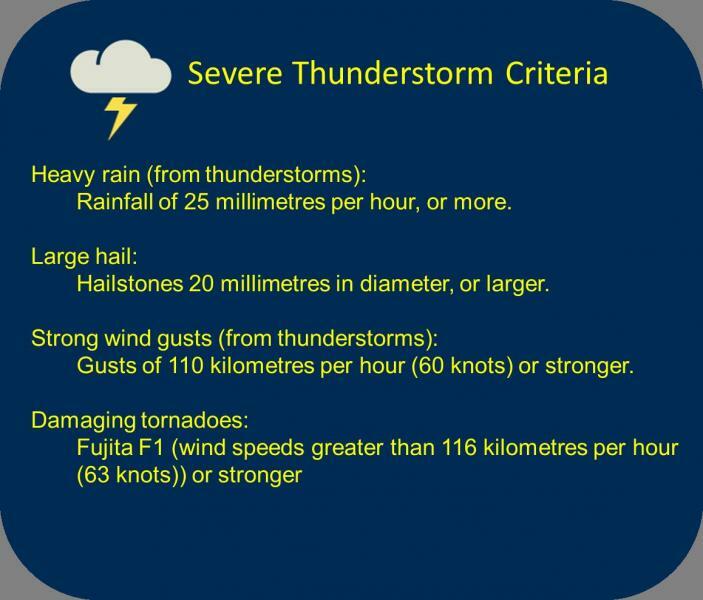 Note: Only one of the above criteria is needed to classify as a Severe Thunderstorm. Above is an example of a Severe Thunderstorm Watch issued by MetService’s Severe Weather Team on Wednesday 23 March 2016. Because local-scale severe weather is usually the result of thunderstorms, and because the identification of severe thunderstorms takes place as they are forming, local-scale warnings are only issued when severe thunderstorms have been identified and are trackable. This is standard practice across most National Weather Services. Typically, Severe Thunderstorm Warnings are for the next hour. Above is an example of a Severe Thunderstorm Warning. Sometimes other aspects of the weather are cause for concern, such as bitterly cold temperatures following heavy rainfall or snow blocking key roads. Although these weather conditions might not meet the criteria for a Watch or Warning, the Severe Weather Team may send out a Special Weather Advisory or Road Snowfall Warning to highlight these conditions. The Severe Weather home page with links to all Outlooks, Watches, Warnings and Advisories can be found on the MetService website here http://bit.ly/AllWarnings. As New Zealand’s Alerting Authority for severe weather, MetService is strongly focused on issuing forecasts and warnings that are as accurate and timely as possible. The MetService website at www.MetService.com has all the latest information straight from the forecast team as soon as it is available.